This model has many benefits: making new friends, tuning in to the seasons and local ecology, sharing knowledge and skills, learning the latest in urban agriculture methods, leading the way in food security and eating a great variety of fresh food! Anyone can get involved but must attend 90 minute induction as a garden volunteer. It's the perfect place for a beginner to start to learn how to grow food. "Learning by doing” is how we do it here. 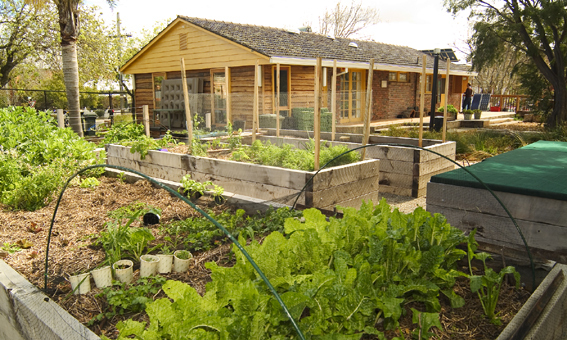 For more information on volunteering in the EcoCentre garden click here. We have just finished our new Aboriginal Cultural Garden, the "Wominjeka" Garden. We have over 50 species, including such plants as bush tucker, medicinal, tools, art and ceremony plants used be the local people. In the midst of this garden we also have a raingarden and gathering space, where stories can be told. Help is always welcome in maintaining the garden. That's right, everyone can now harvest their own fresh, organically grown leafy greens and herbs! Cost $5 for a brown bag. We usually have surplus of heirloom seedlings too (gold coin donation). So come and have a look to see what we have got for you.